While MTV and VH-1 still exist, they are no longer what they used to be. As someone who was actually there when the channels were still relevant, I can say that MTV and to a far lesser extent, VH-1, helped to introduce me to a lot of music during my formative years and beyond. However, as time passed, the two channels moved away from music videos into...well...anything that wasn't a music video. Still, throughout the early part of this century, VH-1 continued to contribute to the zeitgeist with their show Behind the Music. Even if I had no interest in the artist being profiled, this show had a way of drawing me in with its mix of fact-reporting and faux melodrama, proving that we will always be fascinated by a peak behind the curtain. Straight Outta Compton brings these ideas into the feature-film realm, as we get a biopic which profiles a (fairly) contemporary musical act. Straight Outta Compton tells the story of rap group N.W.A., which formed in Compton, California. Eric "Eazy-E" Wright (Jason Mitchell) was a small-time drug dealer. He lived in the same neighborhood as Andre "Dr. Dre" Young (Corey Hawkins), a budding DJ, who enjoyed the rhymes of O'Shea "Ice Cube" Jackson (O'Shea Jackson, Jr.). This trio joined forces with DJ Antione "DJ Yella" Carraby (Neil Brown, Jr.) and rapper Lorenzo "MC Ren" Patterson (Aldis Hodge) and they made their own record. Local music promoter Jerry Heller (Paul Giamatti) hears the record and offers Eazy-E a deal to help legitimize the group. 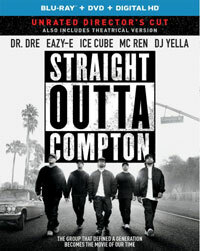 Soon, they are in a real recording studio creating "Straight Outta Compton", the album which would put them on the map. A tour follows, and the guys find themselves performing in front of huge crowds and drawing media attention for their controversial lyrics. However, disputes over contracts and distrust of Jerry soon leads to internal strife in the group, as some members realize that they may do better on their own. I know that some may not think that the Behind the Music comparison is apt, as this is a big-budget Hollywood movie, but, to me, it is right on the money. I do not like and have never liked rap (note that I don't say "rap music") and have little to no interest in learning more about it. But, I can't say no to a music biopic, and as I knew very little about N.W.A., I was willing to give Straight Outta Compton a shot. I'm also no admirer of Director F. Gary Gray, but he does himself a favor here by focusing on the story and the characters, and thus the movie is fairly accessible. The script follows a very natural progression, as we watch the group go from rags to riches to inner turmoil to personal issues to true tragedy. While chronicling the trajectory of N.W.A., Straight Outta Compton also serves as a time capsule of events of from the late 80s and early 90s. From the outset, the film essays the police presence in Compton and the way youths like those in the group were treated. We see that even when the group is in Torrance working on their album, they are harassed until a white man comes along to help them. The movie also brings in the Rodney King beating, the subsequent trial and the riots which ensued. We see how growing up in this environment shaped the words and beliefs of N.W.A., and even when they achieved success, they never lost that defiant spirit. Straight Outta Compton does a good job of blending drama and history, but, as with many biopics, I was left with more questions than answers. You don't have to be Sherlock Holmes to look at the cover of "Straight Outta Compton" and note that there are six people when the movie only offers us five. A quick computation on the old scratch paper tells me that one person was left out of the movie. (I think that it was someone named Arabian Prince, but I'm not sure.) The movie also glosses over who created the "music" which serves as a backdrop to the rapping. (It's implied that it's Dr. Dre, but they could have taken a moment to talk about how important sampling was to creating the sound of N.W.A.) We hear about the contract issues, but the movie misses an opportunity to explain how the group got paid. Those wrinkles aside, Straight Outta Compton held my interest and I truly admire the fact that every character has their bad moment and no one comes away from this looking like a saint. I can't say that we get 100% truth here, I like the fact that the movie wasn't afraid to show the negative. Straight Outta Compton contained a few more swear words than I had been expecting on Blu-ray Disc courtesy of Universal Studios Home Entertainment. The film has been letterboxed at 2.35:1 and the Disc contains an AVC 1080p HD transfer which runs at an average of 24 Mbps. The image is very sharp and clear, showing no overt grain and no defects from the source materials. The colors look good and the image is never overly dark or bright. The level of detail is excellent, as the image is never soft and the depth is impressive. The Disc carries a DTS-HD Master Audio 5.1 track which runs at 48 kHz and an average of 4.0 Mbps. The track provides clear dialogue and sound effects. As one would expect, the music shines here, with very deep wall-shaking bass. The stereo effects are good, but I was surprised by the lack of overt surround effects. The crowd noise at concerts comes through the rear speakers, but it isn't very pronounced. The Straight Outta Compton Blu-ray Disc contains several extras. We begin with an AUDIO COMMENTARY from Director/Producer F. Gary Gray. The Disc contains six DELETED SCENES which run about 6 minutes. Some of these are incredibly brief and look like second unit stuff. There are no new characters or subplots here. We get one more 88-second concert scene with "Deleted Song Performance". "N.W.A. The Origins" (4 minutes) has the actual members of the group discussing what music was like in the 80s and how they came together. N.W.A. talks about how their music influenced music and the environment in "Impact" (2 minutes). "Director's Journey" (3 minutes) has Gray showing us how the look of the film was created, specifically the L.A. riot scene. We are taken on-set to see the amount of work which was done on this. "The Streets: Filming in Compton" (6 minutes) takes us on-location to see the crew shooting on the streets of Compton, as Gray describes the importance of shooting in this area. We see how one of the concert scenes was staged in "N.W.A. Performs in Detroit" (5 minutes). "Becoming N.W.A." (9 minutes) takes a look at the cast and shows how the actors were transformed into their characters.